Man Dares to Take Selfie With Walrus, Gets Killed! As the usage of smartphones get bigger and bigger, it seems that selfie addicts have started to appear dumber than before. One incident took place in China involved a man who took a selfie with a walrus and that same walrus ended up killing him. According to local media reports, a man went to the Yeshanko Wildlife Zoo in the Liaoning province where he took a selfie with a walrus. He reportedly took some video as well which he posted to WeChat while he was present there. 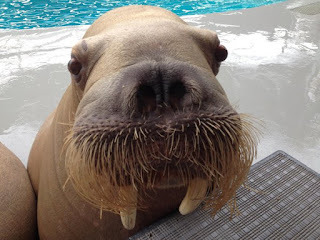 After the man had taken some selfies with the animal, the walrus probably had the impression that the individual was using a lethal weapon on him, so it grabbed the man from the back and threw him into the pool. The man eventually drowned and even the efforts of the zookeeper who had been working there for more than decade failed the save the life of the man. It has been reported that the zookeeper had died as well. It’s currently unclear why visitors would be given this level of access to animals that can weigh upwards of a ton. However, the death of the man did not go unpaid as his family has been given a compensation of a hefty $137,000. It has not been confirmed if the zookeeper’s family received the compensation or not, but our personal view is that if stupid acts will result in imminent deaths, then easy payments like these should not be handed to the family at all. Instead, the death should be viewed as a lesson not to take a torrent of selfies with animals which possess a threat such as a walrus.